One of the big downsides on the modern side of Windows 8 is that, well, the built-in video player is terrible. 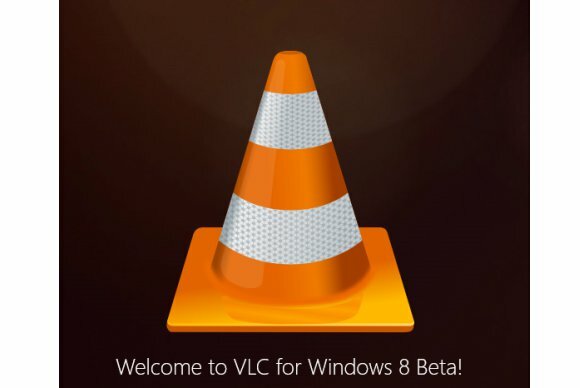 Finally, a worthy replacement has appeared on the horizon for modern UI fans: The long-awaited VLC for Windows 8. Teased last Wednesday, the popular video player from VideoLAN.org—which is famous for being able to playback just about any media file—is now available in the Windows Store. The Windows 8 release is currently in beta, and only available for devices with x86 processors. WindowsRT users with ARM processors are out of luck for now. (Sorry, Surface RT and Surface 2 fans.) VideoLAN teammember Jean-Baptiste Kempf told PCWorld that they want to bring VLC to WindowsRT devices, but the team is currently wrangling with some technical development issues. In my short time with the new VLC app it outperformed Microsoft's built-in modern UI media apps. 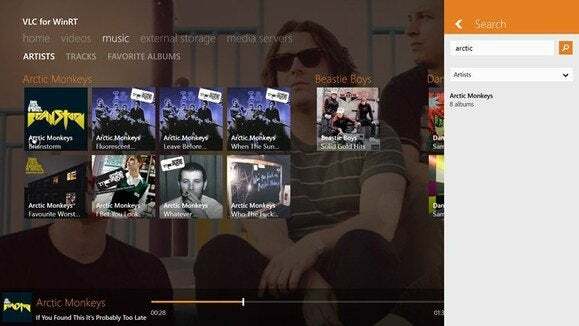 With support for a vast array of video and audio files, VLC for Windows 8 also has enough capability to keep most users with basic needs happy—except for those looking to play a DVD on the modern side of Windows. Previous reports suggested VLC for Windows 8 would come without subtitle support, but that is not the case. I was able to get the app to pla yback a video file and an accompanying SRT subtitle file with no issues whatsoever. A big problem I've always had with Microsoft's modern UI Video app is that the audio often ends up out of sync. VLC for Windows 8, by comparison, didn't have any audio sync problems at all. It was also quick to launch and responsive. When you first open VLC for Windows 8 you're greeted with a typical modern UI-style interface full of tiles representing video and music files as well as text links to jump to different sections of the app. VLC doesn't scroll horizontally from the home screen. For that, you need to jump to the various sub-sections of the app, including videos, music, external storage, and media servers. The video and music sections are indexed from files and folders on your PC. If you have video files that VLC didn't find, you'll need to navigate or search for them on your PC using the icons in the upper right corner of the app. VLC did a pretty good job of indexing my media, but it didn't find everything. The app also made a few mistakes, such as including a Linux ISO file. That's understandable, however, as ISO files sometime contain video. For external storage, VLC will pick up files on pretty much any USB storage device you throw at it. What it won't do is let you play a DVD. Part of the problem, Kempf said, is that Microsoft's modern UI sandbox doesn't allow access to the raw DVD device even in read-only mode. So, for now, DVDs are off limits on the modern side with VLC. 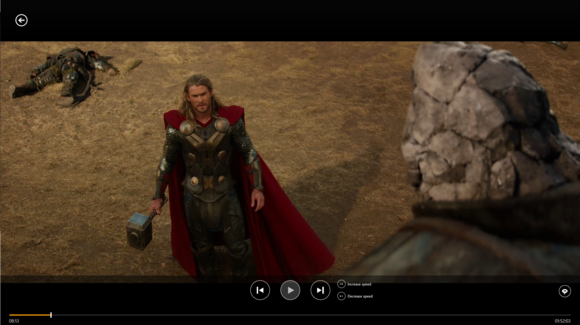 VLC for Windows 8 plays music as well as movies. 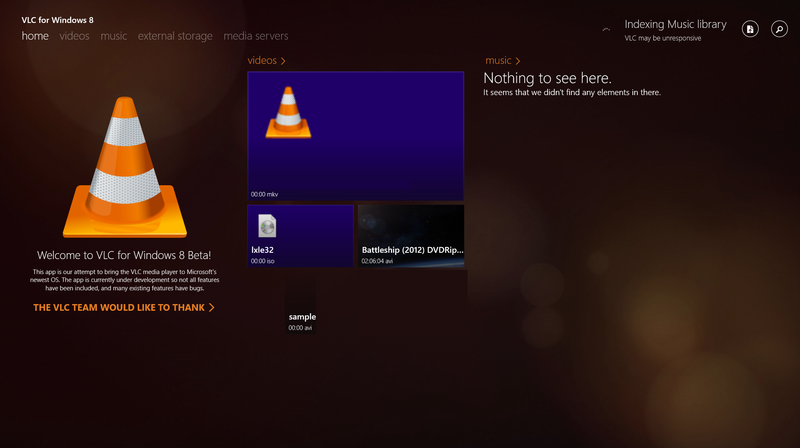 DVD playback brings up another important point about the current state of VLC for Windows 8. If you want to play a DVD using VLC for the Windows desktop, you typically have to choose Media > Open Disc... from the app's menu. On the modern side, VLC has no such option. In fact, it has almost no options at all. The player lacks any options or properties to tweak under the Settings Charm and nothing is buried under the right-click. Kempf said the team plans to offer more features in the future, but so far the team hasn't had a lot of reason to add many settings. After user feedback from this beta release, I'd bet that is likely to change. In the reviews on the Windows Store, some users are complaining the app was very buggy and crashed often. In my brief time with VLC for Windows 8, I also experienced a few crashes. Once when I tried to access a DVD, and a second random crash wiped out VLC's entire music index—meaning I had to search for audio files to play. Other than those few minor quirks, which are to be expected with a beta release, the app worked very nicely on a Lenovo X220 running Windows 8.1.